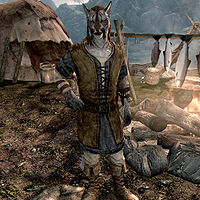 Ma'randru-jo is a Khajiit elemental mage who travels around Skyrim with a trade caravan, which includes Ri'saad, Atahbah and Khayla. When the caravan is camped, he can be found wandering around the campsite. He is also a target of a Dark Brotherhood assassination contract given by Nazir. He wears a set of farm clothes and a pair of boots. He is equipped with an elven sword, and carries a selection of common items and gold. He knows the Destruction spell Sparks and the Restoration spells Healing and Lesser Ward. He is quite rude to you and will often say, "Purchase something or leave. Those are your options." "You're one hard mage to track down, Ma'randru-jo." Kill Ma'randru-jo: Assassinate Ma'randru-jo to complete a Dark Brotherhood contract. "Ma" means "apprentice", and "Jo" which means "wizard" in the Khajiiti Language, Ta'agra. This page was last modified on 17 January 2014, at 00:48.